A group of men stand at the corner of Airport Way and Highway 126, looking ready for a long day of heavy construction work. Some wear coveralls and hard hats while others sport jeans, work boots and reflector vests. But the small group watches as contractor trucks drive by en route to the latest Facebook data center expansion site. They hand out fliers, questioning whether or not the social media giant seeks local contractors to build in Oregon. 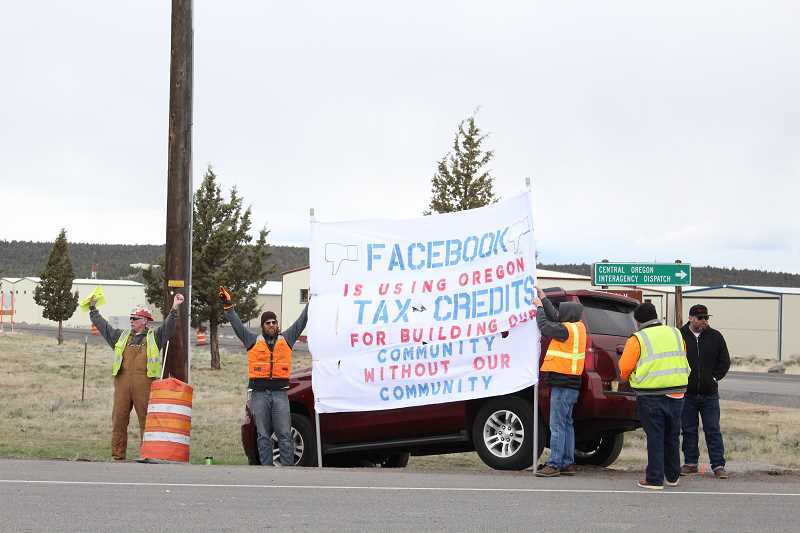 They hold up a large sign, stating "Facebook is using tax credits for building our community without our community," for all highway traffic to see. "We are here supporting some of the community members who are out here, the local unions that are out here. They have an issue with Facebook receiving Oregon tax credits and then bringing in out-of-state contractors," explained Robert Camarillo of the Pacific Northwest Ironworkers District Council. "We have heard that there are over 100 out-of-state workers there right now. That is a lot of work – a lot of jobs that should be staying in Oregon." 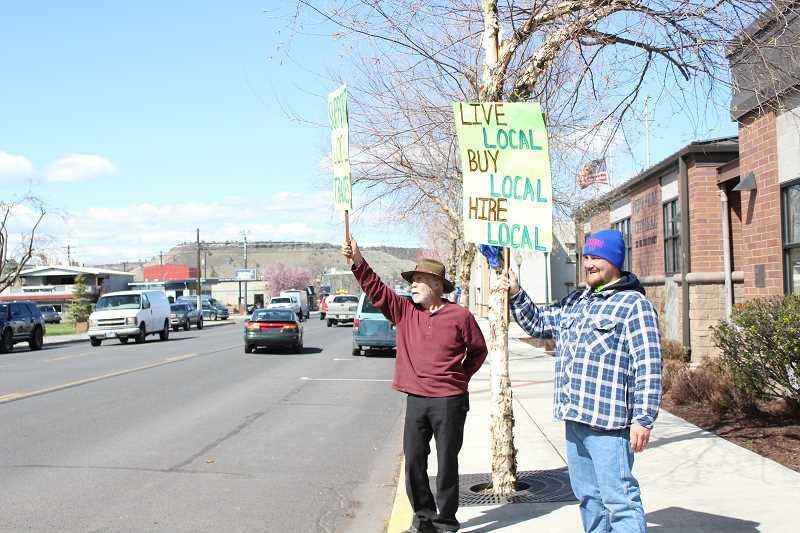 A few days later, another couple people held up signs in front of Prineville City Hall, spreading a similar message of support for hiring local. "We are union ironworkers," said Jon Nortz, who is with Portland-based Local 29 Union Ironworkers. "We are here to support local labor and local contractors to get local jobs." Nortz said he and fellow sign holder Hermilof Estrada Sr. chose the city hall location because of its visibility as well as its connection to launching construction. "That's where it all starts. They have to come down here for their permits," he said. Facebook is receiving a tax exemption as part of the State of Oregon's Enterprise Zone program. The program is available to companies within an established geographic zone. Eligible businesses receive a tax exemption of up to 15 years on the property taxes normally assessed for new plants and equipment. In exchange for the long-term tax abatement, a company such as Facebook is required to provide employment of at least 35 full-time people at 150 percent of the average local wage as well as a capital investment of at least $200,000. While the Enterprise Zone program does not specifically require the use of local or state-based contractors to build a facility, Facebook has historically stated it intends to use local builders whenever possible. "We are grateful for our partnership with Prineville, Crook County, and the State of Oregon and are proud of the number of local jobs we have been able to create so far," said Amy Hunter with Weinstein PR, which represents the Prineville Facebook Data Center. "We are continuing our commitment to local business and labor and expect that an overwhelming majority of workers will come from the region. As of today, we have awarded the vast majority of our contracts and over 90 percent have been awarded to Oregon subcontractors, and over 80 percent of the value of the contracts awarded have gone to union subcontractors." Facebook lists its subcontractors to date for work on the continually growing Prineville data center online. That list includes 12 companies, 11 of which are based in Oregon. Nine of those subcontractors are based in Willamette Valley and two others in Bend. The lone out-of-state subcontractor listed is Sure Steel, a structural steel company based in South Weber, Utah. In response to the recent protests, Hunter pointed out that the new Facebook data center expansion, which was announced in December, represents a local capital investment of hundreds of millions of dollars in addition to the more than $1 billion Facebook has already invested in the facility. "Facebook is strongly committed to the community and to hiring, buying and sourcing locally whenever possible," Hunter said. "When finished in 2021, the Prineville Data Center will be a 2.235 million square foot campus. In December, we announced an expansion that will lead to hundreds of construction jobs. At peak, such projects often have more than 1,500 workers per day on site."